The three components to this easy dessert are the crispy wafers, strawberries, and a little homemade whipped cream. Since I couldn't find the Gavottes, I opted for the crispy crepes available at Whole Foods. You'll find it in the cookie aisle. I went with the ones coated in dark chocolate. Lay 3 of these small wafers down on a plate. Add some lightly sweetened whipped cream (use as much or be as minimal as you want), then place some sliced strawberries on top, adding another dollop of cream to hold the next layer in place. Repeat again, ending with a third layer of the wafers. Dust the top with a little confectioners' sugar and you're ready to go. Place a few extra strawberries on the side of the plate since there isn't a tremendous amount in the layered dessert. Then prepare for a bit of a mess as you break down/crack into those wafers and dig in. A big wide plate with a rim is probably a good idea. To assemble mille-feulle, set 3 wafers side-by-side on a rimmed dessert plate. 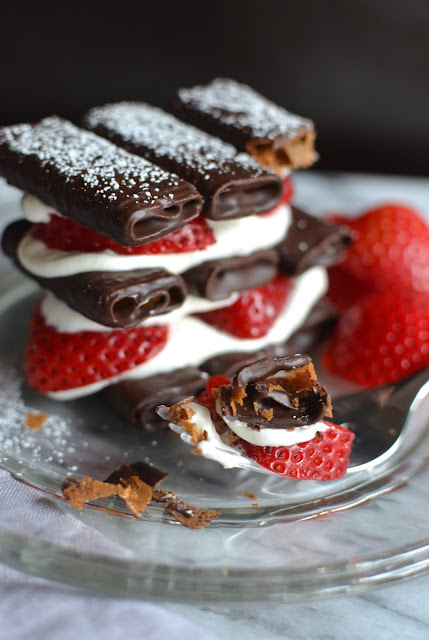 Smooth a dollop of whipped cream over the wafers and place a couple of slices of strawberries on top. Smooth another dollop of whipped cream on top of the strawberries. Repeat with a second layer. Top with final 3 wafers and dust the top with confectioners' sugar. Serve any remaining strawberries, and cream, on the side. These are best assembled near serving time though the chocolate coating on the wafers will keep them from getting too soft, too fast. Expect a bit of a mess as you break into the wafers and dig in! This is totally inspired! So beautiful. I'm still thinking about making something else with my strawberries as they slowly diminish from the freezer. At this rate I'll eat them all before making another thing - which is all good anyway :) I've never heard of these cookies but they are beautiful and perfect layered with the cream and strawberries - gorgeous photos too! I can't barely make myself "do" anything with those strawberries other than to just eat them straight up! : ) My husband does like it turned into more of a dessert and it was fun to put this little thing together. Thanks for all your sweet words. Btw, these cookies are so amazing. I'm so sad I can't get the Gavottes brand but I'm going to keep an eye out for it. Hehe we feel the same way about eating all the berries. They're so so good right now and the kiddos and I can go through pounds in just one sitting sometimes. Love how easy this dessert is. It looks elegant and the layers are so pretty. I've never seen these cookies before too but they looks so chocolatey and delicious! It's mostly water, right, Kelly?! The farmer's market had a strawberry day yesterday and it was fun to stop by and pick some more up. I can't believe I lived so many years without enjoying it but better late than never. And these cookies - they are awesome!! This is such an elegant dessert...I love the crispy chocolate crepes, with the creamy whipped cream and the freshness of strawberries...thanks for the recipe Monica. This is a pretty dessert - wow!! We are also pounding the strawberries lately! I bet! Enjoy every single one, Ashley. I am off to get more today if I see any good ones. Always so great to hear from you, Jo! Hope you are enjoying life and eating well (I know you are!). This is a simple prep dessert...I'm sure you can get the Gavottes biscuits and it would be even better! Thanks for stopping by and saying hi! This proves that good food doesn't have to be complicated and time-consuming. 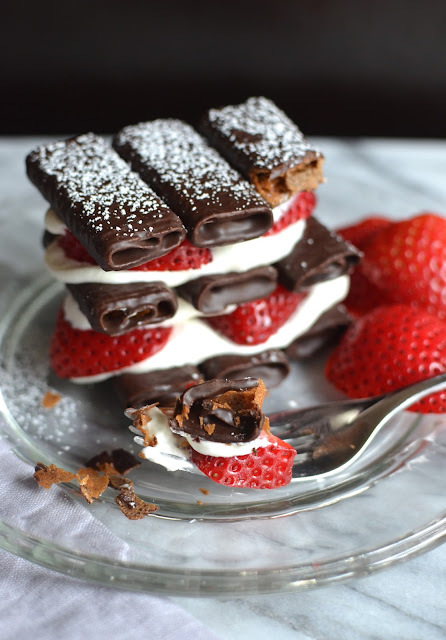 I need to get some chocolate mille feuille to try. It would even be good layered in a parfait glass withe crepes crushed up between layers of whipped cream. That would be even easier to put together and to eat! Thanks, Angie. Oh gosh, I've eaten soooo many strawberries too since they've come back in season!! haha at least it's fruit right?? Love this simple dessert - one of my favorite ways to eat strawberries is with a little fresh whipped cream and those chocolate wafers would just make it even better! Things just taste so much more intense and just better when they're in season! I am trying to make it a point to eat more seasonally. Thanks, Lorraine. Monica, this is an incredible looking dessert. It looks so rich and decadent - I love it. Pinned. Thanks, Kristi. It was fun to put together. Hi Monica, I love this......it does not get any better than dark chocolate and strawberries. Thank you, Cheri. You can't go wrong with those elements, I agree! Thanks so much...definitely easy to assemble! Monica that first photo has me in a trance...I can't stop looking at it. Gorgeous shot. I love how simple and easy dishes can be with a little creativity. I need to see if I have can find those little chocolate covered biscuits here...We only have a couple more weeks of peak strawberry season so need to make the most of it. It's too easy to make this dessert, Monica! : ) Glad you like it. Gorgeous dessert! And super easy! How great is that? The chocolate crispy cookies sound delicious with the sweet cream and fresh strawberries. Perfect way to celebrate the strawberry season! I need to look for those cookies now. Exactly...so easy. Messy to eat but tasty and easy. The cookies are so addicting just on their own. Yum!! OMG...this is just getting better! First the ice cream and now the mille-feuille. It not only looks beautiful but is simple to make despite having all the qualities of a brilliant dessert. haha - thank you so much, Sonali. It is too easy to make and you could really just make a trifle out of it and crush the crepes...even easier. I love any desserts with feuilletine and these crepes give you that texture and taste.